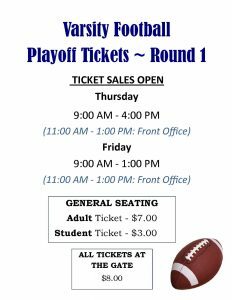 Boys Varsity Football · Nov 9 Tomball Memorial Varsity Football – Road to State 2018! 1. Gates will open ninety minutes before game time. 2. No in and out privileges—ticket will be required for each entry. 3. No food, beverages, containers, pets, or backpacks, may be brought into the stadium through entry gates. 4. No ice chests allowed in stadium except for teams and support groups. 1. Absolutely no climbing over, standing on or sitting on bleacher rails. 2. Spirit signs must be made of vinyl that can be tied to stadium railing. 3. NO PAPER, PAINTED SIGNS ALLOWED. NO SIGNS OF ANY KIND MAY BE TAPED TO THE STADIUM. 1. Movement from one side of the stadium is closely monitored and may be prohibited. 3. No students are allowed to move from one side of the stadium to the other. 4. Parents of band/drill students will be allowed to move from visitor side to home side prior to half time on south end of stadium. 5. LISD reserves the right to assign seating to all fans.